Last weekend, I took a train to Plymouth to visit Dragan and Penny, who run a microbakery. I'm going to write it up for Love Food so I'm not going to dwell much on the experience here. Suffice to say it was bliss. Sitting on a crowded train on the way home, with a bag of nine loaves on my lap for five hours was not. My hips ached for days. I took bread to two of my neighbours and to the lady at the flower shop, they seemed pleased although I think the rye bread with caraway and figs had a crust that might break teeth. I sliced up the rest of it (heartbreaking, really, they were such pretty loaves) and rammed them into the freezer whilst making a promise to myself that we would eat a little bit each day. Actually, that has worked reasonably well, several wholesome lunches of soup and bread. If the sun ever shines, I'll do salad and bread, and some oil and vinegar for dipping. Deborah Madison’s ‘New Vegetarian Cooking for Everyone’ has arrived at the perfect moment and done me a power of good. Frankly, 2014 has been the year from hell so far. After 14 years, I’ve finally had my job as Editor of The Vegetarian magazine taken off me – can’t convey how distraught I was about it. Utterly destroyed. Sitting here symbolically burning my business cards and wondering if there is anybody else in the world who has need of a highly experienced and totally dedicated vegetarian magazine editor. Hearing that my dad was in intensive care in a hospital 200 miles away, then getting my very own trip in an ambulance with a suspected miscarriage, followed by a really painful biopsy, topped off with a minor car crash and witnessing a suicide … it’s a mix I could never have dreamed up. Kudos to whichever malign spirits worked out how best to hurt me, job done. Anyway, although I do tend to mash bits of my life into the blog mixture, that’s as much as I can bear to talk about it right now. So there I was, all cried out and without any appetite for food or life in general, when this beauty of a book arrived. Really, it’s a very pretty thing. (Note that I’m inclined to be more impressed by good type design than by indifferent food photography.) Yes, I know it’s a re-issue of an oldie, but what an oldie. 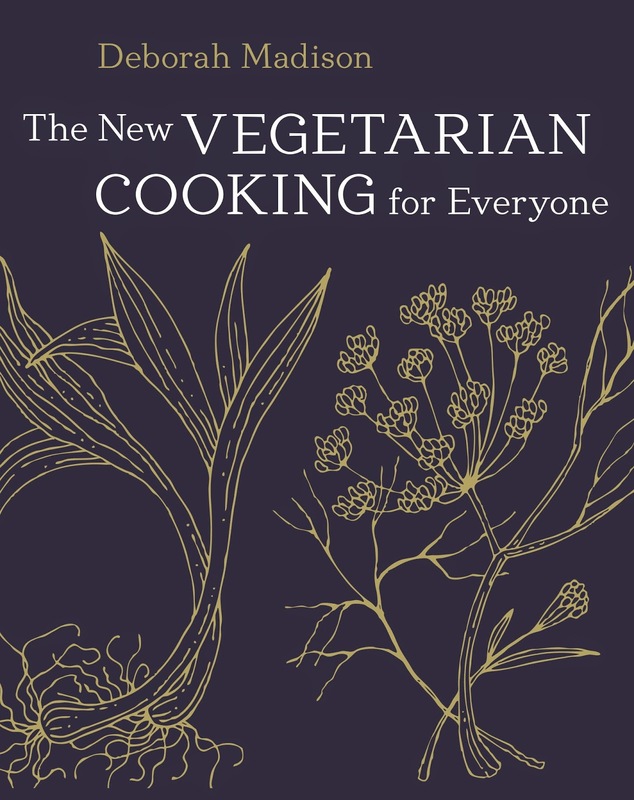 There are apparently 400,000 copies of ‘Vegetarian Cooking for Everyone’ dotted around the globe – naturally one of them is mine, and working my way through the new edition was a wonderfully comforting and grounding experience. It took me right back to the thrill I was feeling about cooking in the late 1990s, when I was really getting into teaching myself new techniques and having a lot of fun in the kitchen. It’s full of the kind of food that I really like to cook. Not fancy, but thoughtful. Lentil and caramelized onion croquettes with a red wine tomato sauce might sound boring or old-school to some, but to me, it’s like going home. This is quite possibly my desert island book choice. 1,600 recipes over 670 pages and every one’s a winner. It’s the kind of book that has me curled up on the sofa for hours when I ought to be actually cooking something for tea. I seem to be able to live on just the idea of food, sometimes. I wonder if my brain thinks I’m eating. If I started picking out things from this book that I want to cook, this would be a very long blog. I had to read the book in two sessions (and I’ll probably have to go through it again with some post-its). The second half of the book covered tofu – loads of good ideas including caramelized fried tofu and some great fruity dipping sauces to go with it – some interesting variations on breakfast and a really inspiring section on quick hand-made breads which broadly covers anything a bit bready that might appear alongside a plate of food. So lovely. I loved the snippet of info on shrubs and switchels – syrups made with fruit and a dash of vinegar, perfect diluted with iced water on a hot afternoon. There’s endless scope there to experiment with herbs and ‘botanicals’ all summer long, and still have them in the cupboard when the nights start drawing in. And I also loved the long section on fruit-based desserts – inspiring, especially the sauces. My (very random) prize goes to the cream cheese mousses with rose geranium leaves. I’d quite like to stay on the sofa with this book until somebody brings me one of those, on an antique saucer with a teeny silver spoon and another cup of tea… but I guess I’ll have to do it myself. I’ve always found cooking to be a therapeutic activity. Losing my will to cook was a bit like losing my will to live. Thankfully, now that I’ve had a hug from Deborah, I’ll be able to gather myself up and get back into the kitchen to show myself a bit of love. Open up the envelope and, would you believe it, they’ve invented a whole new genre of cake. Cake, for me, is mainly a cold weather thing, comfort food, sweet and dense after a cold walk. But look at this – a cake baked in a silicon mould shaped like a sandcastle. They’ve invented a beach cake! You can even buy a silicon mould to make little sea shells out of icing! Now, the floodgates are open. 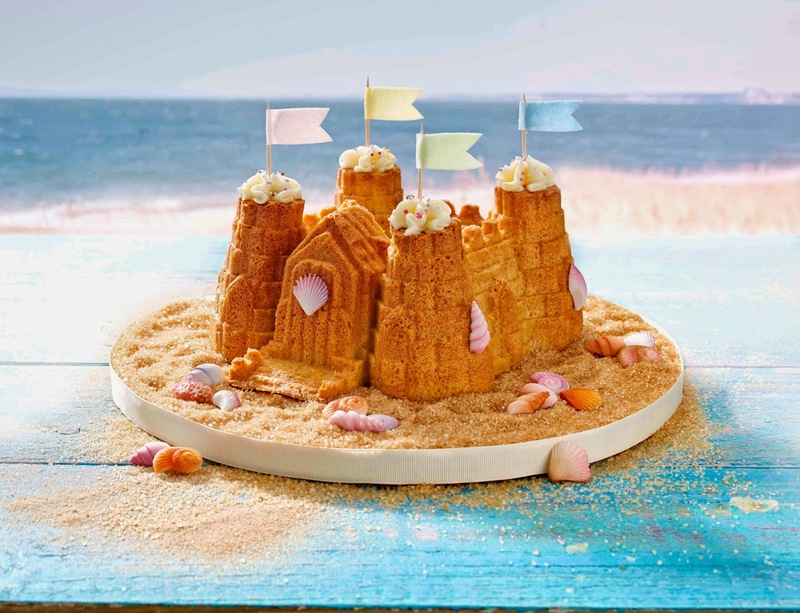 A beach cake is a simple sponge… it must be given a flavour, surely. Especially because we’ll all have a worrisome thought at the back of our minds that if it looks like a sandcastle, it might taste like a sandcastle. Having eaten sand at the age of about three (it looked like sugar), I have no urge to repeat the experience. So, what flavours would suit a beach cake? Is there any scope for introducing some carefully controlled sea salt? This would be enough to trouble my brain while I slept* if I wasn’t distracted by the fabbie ice cream van cupcake stand on the facing page. Imagine the cheery family scene. Almost justifies giving birth. Good job I didn’t see it when I was in my twenties. I leafed through the rest of the catalogue as fast as I could – trying to pick out anything unusual without lingering long enough to start an obsession. I’m still feeling the lack of crumpet rings in my life. Past the baking tins, into the expensive bits of kit, trying to keep moving… and then I came to a shuddering halt when I got to the perfect pinwheel pastries. Look! £4.99 gets you a really nifty pastry cutter – just add a blob of practically anything, sweet or savoury, to act as a filling, fold the points into the middle and hey presto! 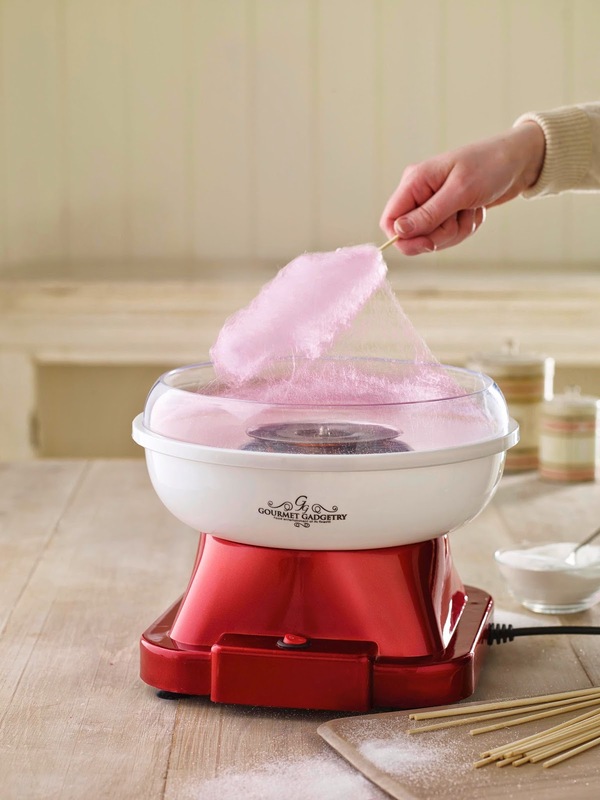 If I had one of these I would be making pinwheels out of everything. 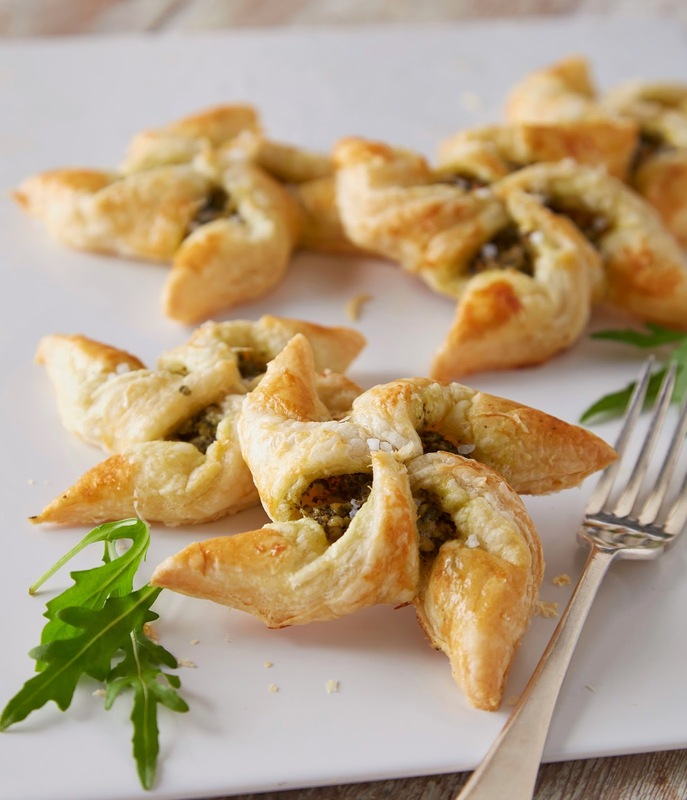 (Look, I know I don't need a pinwheel pastry cutter to make pinwheel pastries. But I want one.) Literally every jar of jam in my cupboard, and every scrap of leftover veggie haggis, would be pressed into service. It would be like that fairy story where a man is promised that whatever he is doing as the dawn breaks, he’ll be doing all day. Cunningly, he plans to be counting his money when the sun comes up. Then he realizes that he will need lots and lots of money bags. He runs up as many as he can – and slightly miscalculates, so he’s sewing money bags at dawn. He spends the day tearing up his clothes, his curtains, his carpets, and making money bags out of them. So it would be with me and the pinwheel pastry cutter. I’d be feverishly making them all day long. Rarely have I seen anything I want so badly, no joke. By the way, I cooked the big scary veggie haggis. Possibly I didn’t take it out of the oven on time because it burst. Thankfully it didn’t plaster the whole of the inside of the oven with matter. I was pleasantly surprised to find that the consistency was far firmer (nay, crumblier) than the burger-shaped version. 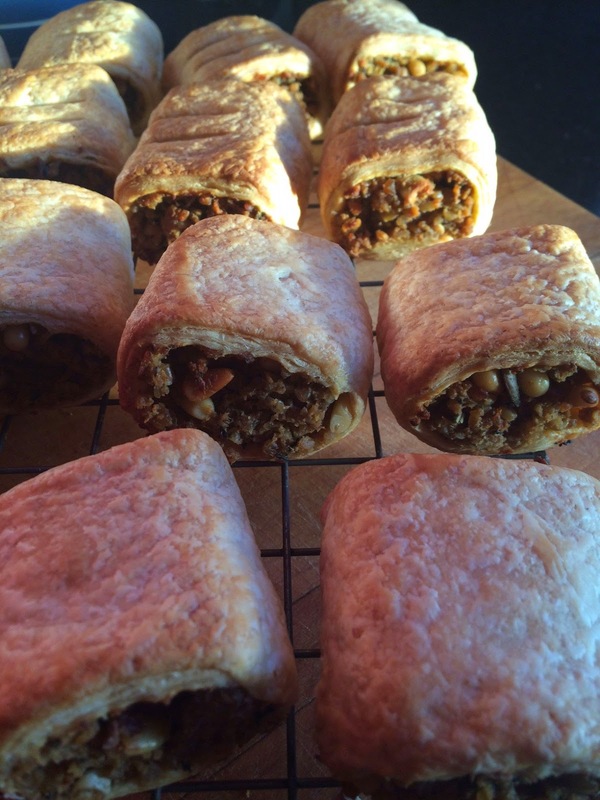 Having located the elusive pine nuts I did make the sausage rolls – I’ll paste a picture in to prove it. They were pretty good. Next time I’d up the seasoning even more so that a little bit of filling holds its own against a mouthful of puff pastry. Really glad I pushed on with the experiment, it was only the texture of the burger-shaped version that I didn’t much like, and the texture of the big brother is quite different (with the proviso that the experience might have been different if I hadn’t cooked it to bursting point…). * PS - Last night I dreamed of a new sort of chocolate called an 'ocean whisper'. It had the texture of a Wispa bar, with tiny bubbles, but included a dash of sea salt. Somebody make me some. By way of proving that the year is getting away from me, I find myself eating vegetarian haggis. 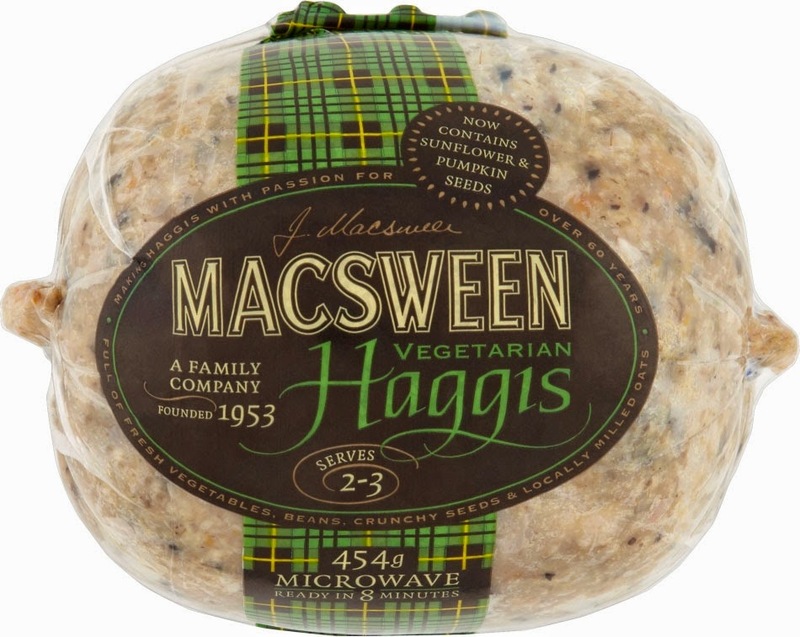 It's April, and the moment may seem to have passed (unless there's some tradition of eating haggis at Easter that I've missed) - but the whole of 2014 is momentous because it turns out that Macsweens have now been manufacturing vegetarian (vegan, in fact) haggis for thirty years. Haggis has never been something I find appealing and I was slightly bemused to have it sitting plumply in my fridge. But thirty years is long enough to ignore it. The fact is that plenty of vegetarians swear by the stuff - it's a really versatile ingredient. I'm fairly sure I ran into it shortly after it made its debut in 1984 - that was around the time when I started dabbling with the oddities on sale at my local 'health food shop', Hull Foods. Why didn't I have a go with it? Perhaps because I've never eaten a 'real' haggis - it wasn't something I had previously enjoyed, or felt the need to replace. Perhaps because I couldn't see the potential in it - my cooking skills were only just emerging, I would have been flummoxed. And way back in 1984, we didn't have the internet and all those tasty-looking recipes to encourage a bit of experimentation. The packaging has changed, too. As well as the slightly daunting haggis-shaped article, you can now buy the mixture shaped into handy burgers that can be grilled, fried or microwaved. They seemed like the entry-level option, so I took a lead from a serving suggestion and fried one up to boost my beans on toast. It would be interesting to look at the protein quotient in that plateful - wholegrain toast, too much butter, good old beans and a veggie haggis burger that boasts 6.4g of protein per 100g - that's not bad, and if I ditched the butter it would have been vegan. The haggis's main constituent is oats, but there are lentils, kidney beans, sunflower seeds and pumpkin seeds in there too. And how was it? Easy and super-fast to prepare, for a start, with an impressive shelf-life. Taste-wise, the rumours turn out to be justified - there's plenty of savoury flavour and a nice herby background. The herbs aren't detailed on the pack but I think it tasted of sage, with plenty of black pepper. No idea if it tastes like a haggis. Doesn't really figure. The texture, though, I thought could be improved - again, maybe it's the authentic consistency of haggis, but for me, it was rather soft and smooth. Might be the inveterate experimenter coming out in me, but I reckon it would benefit from some chunkiness - some roughly chopped roasted hazelnuts or a handful of toasted pine nuts would really add something nice. Of course, the haggis in either form is there to be played with and once I have had a go with the haggisy-looking version to see if the consistency is the same, there will still be plenty left for me to experiment with. I fancy adding the pine nuts and a blodge of sundried tomato paste, and making some mini sausage rolls with it... well, if a haggis needn't contain meat, surely it needn't be Scottish either...? Maybe it can be a bit sunnier... I'll investigate. I've noticed a trend that's worrying me. I interviewed Aiden Byrne a couple of weeks after he launched Manchester House, see blog entitled 'Enemy Territory?' for the full write-up. Something came out of my chat with him that has been bothering me ever since. I had the lovely Clarissa Hyman, a colleague from the Guild of Food Writers, with me for the ride, and she observed that the menu was very vegetable-based - perhaps not so much a vegetarian menu as a vegetable menu. Where, she wondered, were the fabulous cheeses? I took it further - where were the grains, nuts, pulses, seeds, eggs, tofu, tempeh, seitan...? One of the first dishes on the lunchtime taster menu was a risotto of barley (which I have also seen called a barlotto) with cobnuts, topped with a blodge of smoked apple puree - very nice. One of the dishes that followed was a medley of foraged mushrooms with some salsify - great, but mainly veg... then a highly decorative plate of heritage carrots arrived, accompanied by a green olive paste, spherified, to make it look like an olive, which seemed more like a showcase of techniques than a balanced dish. 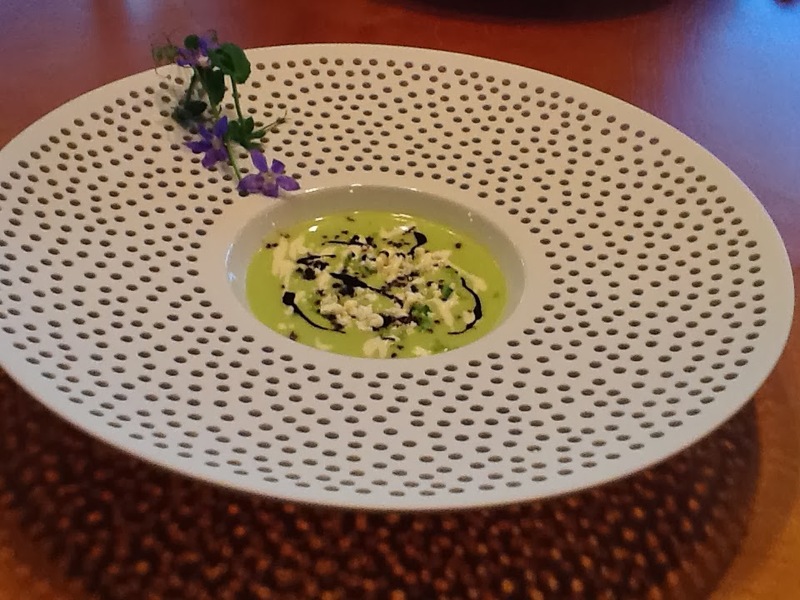 All right, it's a taster menu, the individual dishes don't have to be balanced. 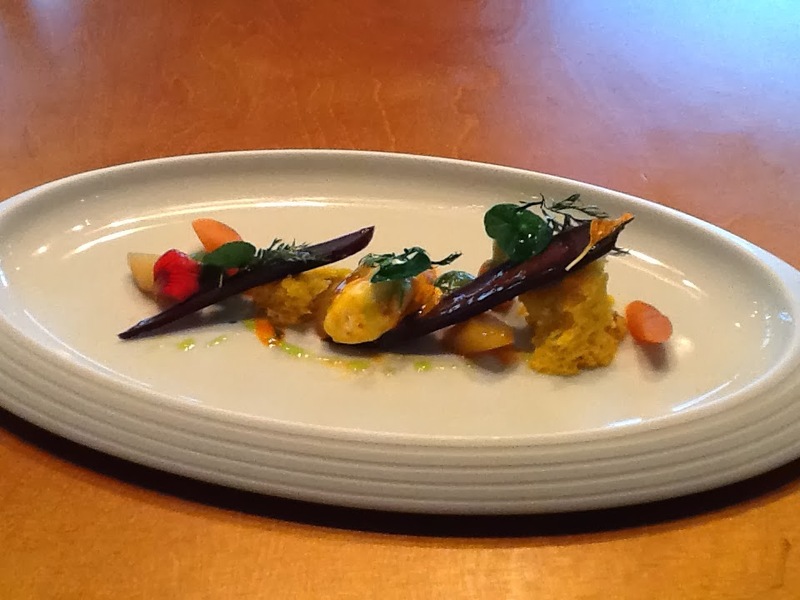 But as a vegetarian, when a chef thinks it's OK to offer me a plate of carrots, I get a bit nervous. I asked Aiden about how he devises his vegetarian dishes, and everything fell into place. He said that for a chef with his experience, it's straightforward. He simply devises a dish and then 'takes the protein off it'. Ah. I might have let this pass, but a throw-away line in a recent episode of Masterchef Pro hit the same nerve. One of the contestants said 'Scallops were the first protein I learned to cook'. Here's the issue: since when did we start refering to meat and fish as 'the protein'? I don't like the implication that only meat and fish contain protein. I don't like the way that the phrase somehow justifies the consumption of meat - it's protein, the protein. We all need protein. Finally, I really don't like the implication that vegetarian food is food without protein! Patently, that's not true. Vegetarians and vegans are not going short of protein unless they are eating very little food or imposing some very strange dietary restrictions upon themselves. I can't help feeling that the move towards referring to meat and fish as 'protein' is something that the meat industry must be loving - possibly even fuelling. It means we don't need to look too closely at what is on the plate - it's just protein, it's necessary. I guess this is going to come in very handy when we start being offered lab meat, reclaimed/reconstituted meat and soylent green. No need to question it, it's 'the protein', eat up, you need it. I also feel that this new terminology might be partly responsible for what is happening at Manchester House: vegetarians don't eat 'the protein', so all you need to do is take 'the protein' off the dish and hey presto, you've made the vegetarians happy. I once received a letter from a woman complaining about provision for vegetarians at a works barbecue. Her gripe was that although she had given the organisers plenty of notice that she would be looking for vegetarian food, when the moment came, she was only offered vegetable kebabs. At first, I couldn't see what she was upset about - after all, somebody had taken some time and trouble to provide a vegetarian alternative. I came to the conclusion that either she would have preferred to blend in by having a veggie burger or sausage, or that she was peturbed by the fact that she was effectively being given a plate of vegetables to eat, not a balanced meal. No protein. Well, not an awful lot. Thanks in part to the angry veg police, a lot of chefs are as nervous about feeding vegetarians as they are about feeding coeliacs or nut allergists. Being too demanding and difficult puts them off, and whilst a complaint might help to educate the chef and maybe ensure that the next veggie through the door has a better experience, it can also make chefs dig their heels in. As for vegans... I once worked at a vegetarian restaurant where there was a policy not to claim that any dish on the menu was suitable for vegans. In fact, the were plenty of vegan options, but the owners felt that vegans were out to find fault, and eventually decided that they would rather turn them away than keep trying to make them happy. It would be a great shame if Aiden Byrne was on the receiving end of criticism so sustained and fierce that he stopped trying. It's delightful when chefs decide to do something that seems novel and brave, and announce that a vegetable is the 'hero' of one of their plates. It's nice to see vegetables celebrated in all their diversity of colours, flavours and textures. More and more chefs are getting wise to this, and it's a safe option because by sticking closely to vegetables and not much else, you can probably create a dish that's likely to be acceptable to a very wide range of diners. Sensible. But vegetarians don't only eat vegetables, and we all know that there are almost limitless opportunities for innovative combinations. I would love to see a vegetarian taster menu that included some locally grown nuts, artisan cheeses, heritage grains and even a daring foray into the world of lentils and beans. Bring in some unusual takes on tofu, and other soya-based foods. Maybe even show us what top chefs can make from Quorn, which is slightly in danger of being relegated to pub grub status. Show us some new ways to present eggs and cheeses. Maybe a menu like this would attract more sales to non-vegetarians. (Although I understand that the vegetarian food at Manchester House is often gratefully received by meat-eaters who find frogs' legs a step too far.) It might also help to justify the price tag when the vegetarian menu is priced identically to the meat-based menu. The launch of a new restaurant, headed by a Michelin-starred chef, is big news in any town. Aiden Bryne, who picked up his star in his early twenties, has just opened a restaurant in Manchester city centre which sets out to provide a very classy dining experience. It's situated in the Spinningfields area, which is the newest part of the city to have been fancied up, and now features shiny new towers, wide walkways dotted with designer boutiques and a sprinkling of art galleries and restaurants. Manchester House is far from obvious at street level, and perhaps that's the way the owners want it. Announce yourself to the receptionist on the ground floor of Tower 12 and you'll be spirited up to the lounge at level 12 for a drink before you dine. Floor to ceiling glass means a panoramic view of the city but a slightly chilly atmosphere if you happen to visit when it's raining. And let's face it, this is Manchester - it rains a lot. Byrne's opening menu is not for the squeamish - foie gras, snails, frogs legs and lambs tongues are enough to make many diners nervous. As a vegetarian, even setting foot in the place was almost taboo - foie gras is pretty unforgivable, and the open kitchen was far from entertaining as far as I was concerned. But Byrne has wrong-footed us. 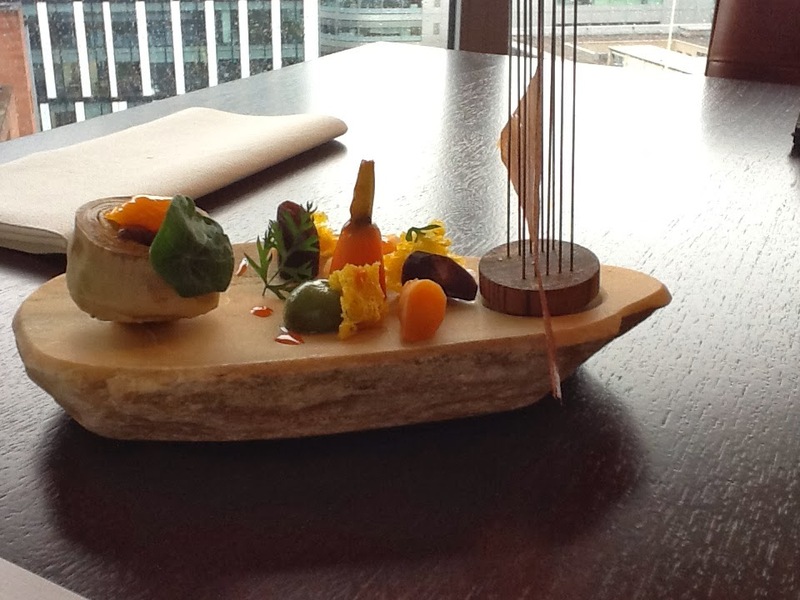 Alongside his a la carte menu, six-course lunch taster menu and 14-course evening taster menus are completely unexpected vegetarian equivalents, including a 14-course vegetarian taster menu - a thing so rare as to be practically non-existent. I asked Bryne why he's taking the trouble to provide equal billing for vegetarian food. He told me that about ten per cent of customers order at least one vegetarian course and confessed that although in his younger days he was pretty dismissive towards vegetarians ('Give them the mushroom risotto'), he has now 'grown up'. And that means thinking less about his own ego and more about providing hospitality - to all the customers. One member of staff also told me that some customers find the meaty menu rather scary, and are rather relieved to be offered the vegetarian alternative. Taster menus are about showcasing the chef's talent with a series of delectable morsels, artistically presented. Byrne describes it as 'going on a journey' - certainly the six-course vegetarian menu I experienced was quite an event. Each course had a style of its own and the plates, bowls, slates and wooden boards bearing the food were all designed specifically for the restaurant. 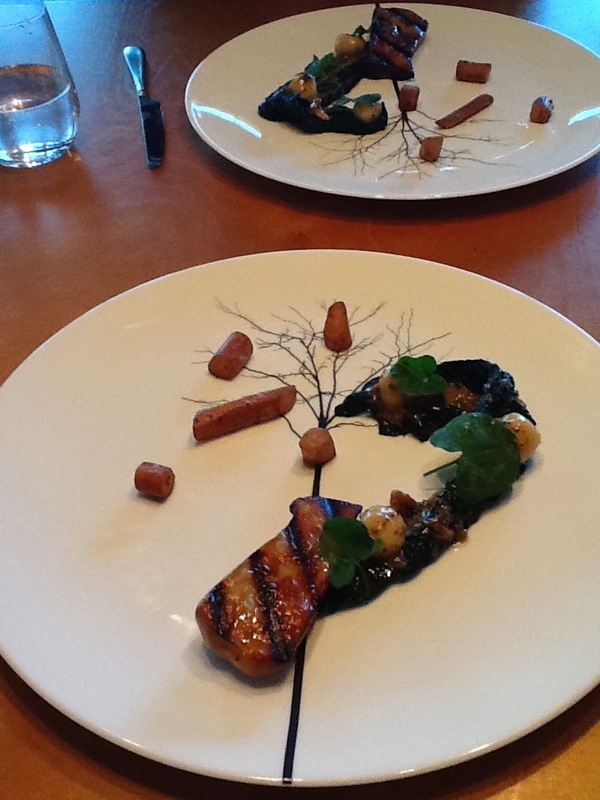 Flavours and textures were suitably varied, and some nice seasonal veg were in evidence. Byrne has a forager on staff and also takes boxes of produce from local smallholders, so the menu is flexible depending on what comes through the door. We started with a warming onion broth with a crumbly onion bread and a scoop of soft, smooth roasted onion butter which I will be trying to replicate at home. A tasty cobnut risotto was topped with a tasty and unusual smoked apple puree, heritage baby carrots were accompanied by spherified olive paste and the finale was a chocolate fondant topped with a macaron and encased in a giant chocolate-ice bubble. It was all good fun and suitably satisfying to both the eye and the palate, although for me, the truffle oil made rather too many appearances. Never liked the stuff, and it lingers. The menu feels a little short on protein - although I didn't go away hungry, my initial impression was that the dishes were vegetable-centric, and that some more pulses, cheese, tofu or tempeh would have been welcome. Byrne describes a creative process that involves marrying flavours, and explains that classic vegetable combinations work with or without meat, but I think his creations would benefit from the addition of some alternative sources of protein, and perhaps there is some scope for exploring ways to bring beans and lentils to the fine dining table. Vegetarians dining in 'mixed company' will need a steady nerve, although there's a lot to be said for taking meat-eaters to a restaurant where vegetarians aren't treated like second-class citizens. I applaud Bryne's willingness to respect vegetarians, and I hope the vegetarian menus attract enough support to make them a permanent feature at Manchester House. But even a 14-course vegetarian showcase couldn't quite divert me from my personal disquiet over the non-vegetarian food on offer. It was interesting, but it didn't feel right, and I doubt I will go back. Calculated to torpedo my New Year frugality vows, the Lakeland catalogue has arrived and I am trying hard to ignore the electric mini pie maker, decorating spoons and crumpet rings. I half convinced myself that buying crumpet rings would save me money by enabling me to make crumpets, but reluctantly concluded that I already have various metal cooking rings which would serve should I ever want to give it a go. Here's the deal - if I ever make crumpets with rings that aren't fit for purpose, and really want to make them again, then I might be allowed to buy crumpet rings. But I'm not allowing myself to buy them on the offchance. The same goes for the decorating spoons. I used a couple of these in the photographer's studio when we were doing the pics for The Adventurous Vegetarian and they were great. I didn't know such things existed. I badly want to own some - but have reluctantly decided that I might be able to buy them if I get offered any food styling work and could actually use them for any purpose other than making myself chuckle. With the proviso that if I'm working at Graham's photography studio again, I can just use his. The electric pie maker has the strongest draw. I can just envisage myself knocking out perfect little pies at the drop of a hat. That's how it works, of course, I'm not really buying the product so much as buying the lifestyle. Naturally they would be filled with delicious food scraps and left-overs. That would save me money, wouldn't it? Please say it would. The machine is £30. The new Lakeland catalogue is very strong on food saving and money saving gizmos. I can well believe that the mini oven uses less electricity than my full-sized one, but maybe rather than owning two ovens, the best thing to do is to try to cook several things at once. On this principle, last night I rapidly asembled an apple and oat flapjack/dessert which went into the oven with two dishes of puff pastry topped left overs (spicy lentils and broccoli in cheese sauce, respectively) and a baked potato that I 'd pre-blitzed in the microwave. Result - lots if left over apple pudding. The trouble with cooking too much at once is that you end up eating things cold the next day, or reheating them. Either way, they're probably past their best. Meh. The cost of cooking things is always the missing piece of info in so-called money saving recipes, and I think it's probably because nobody on earth has a clue about how much electricity it takes to heat up a pie, much less how much that electricity costs. (As it stands, it could be costing every person on the street a different amount as we are all paying different rates for fuel.) It's an annoyance that has been nagging away at me for years - as a student I wrote to Friends of the Earth to ask them which was best for the planet - an electric kettle, or one I could use on a gas hob. No useful reply. Poring over the bills won't help, I suspect - they're renowned for being impossible to understand, and (oddly) mine have suddenly gone down which makes me suspect that either I have been overpaying like crazy for years, or there is a mistake happening right now and sooner or later I'll be required to make up the shortfall. They keep coming at looking at the meters, and my usage must be pretty predictable, so ... ach, let's not go there. So I don't know how much it would cost me to use an electric mini pie maker to bake a batch of six pies, or how that compares with doing them in the oven (where in theory I could probably bake about forty mini pies at once, which would be pointless as the freezer is rammed and I'd only end up cooking most of them twice...). I'm also hopelessly confused about the Lakeland gadgets on offer. The machine to seal left overs into plastic bags isn't fooling me, even I can see that I would have to save an awful lot of left overs to justify the £160 price tag (and extra bags are £17!). To be fair, it's not just a thing for sealing bags, it's an intelligent vacuum sealer capable of creating those plastic parcels that you can then cook 'sous vide' if you also buy the sous vide machine (£250). We've all seen the harassed contestents on MasterChef Pros using the sous vide machine to do exciting things with unpromising bits of meat, but as a vegetarian I think it would be wasted on me... I may of course be making a fool of myself and missing the point. The machines that I'm really at sea with are the pressure cookers and the slow cookers. Again, perhaps this is because the bottom line is that these are machines for rendering cheap meat into a reasonably tender state. Irrelevant to me, so maybe that's why I've not applied myself before. What do pressure cookers do? They feel like something from wartime, and I think my perception of them is coloured by apocryphal stories about them blowing up. Why would I want to cook something under pressure? It's obviously dangerous. Is it quicker? Does it take less fuel and is it therefore a cheap way to cook? Or is it all about dealing with gristle? And what is the difference between a pressure cooker and a slow cooker? I can see the obvious. But what's useful about a slow cooker? Is it a really cheap way to cook? Just a way to keep something on a low heat for a long time while you are out? Why would I want to keep something warm for hours? Is this just another gristle tenderising gizmo?